Demba Ba has returned to Shanghai to re-sign for Shanghai Shenhua who play in the Chinese Super League. In his previous stint playing for the club he had a very impressive scoring rate, netting 29 goals in 37 appearances spread over two seasons. 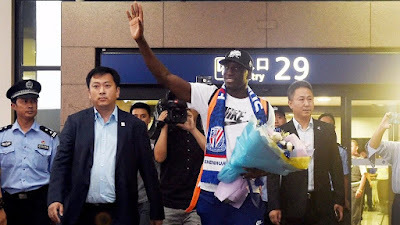 His goal scoring record for Shenhua easily explains the reason why so many fans turned up at the airport to welcome his return to the club. During his Ba’s second season for Shenhua he suffered a horrific leg break in a match against Shanghai SIPG and Gregorio Manzano who was Shenhua manager at the time said that the break was so bad that it could potentially end Ba’s professional career. French doctor Olivier Bringer performed surgery on Ba's fractured leg successfully on 22 July. Bringer then stated it would be possible for Ba to start playing football again. Demba Ba successfully recovered from his broken leg and was then loaned out to Turkish giants Beşiktaş, this was likely a direct result of the foreign player rules that are implemented in the Chinese Super League. If Shenhua kept Ba on their books it is possible he might not have been up to the same level he was before the broken leg, and with only 4 foreign player spots being available in the squad then they could send Ba out on loan to regain fitness while at the same time freeing up a spot for another foreign player. In his first season on loan at Beşiktaş he scored 27 goals in 44 games, which is an excellent goal scoring record that he has kept going throughout his entire career. He was instrumental in Beşiktaş having a successful season. In his second spell on loan with Beşiktaş however, he only made 2 appearances and scored 1 goal. After his stint with Beşiktaş he then moved on a free transfer to Göztepe who are a lesser known Turkish side compared to Beşiktaş and are based in the Güzelyalı neighborhood of İzmir. During his time in Göztepe he managed to keep up his excellent goal scoring rate by netting 7 goals in 13 games showing he is still an absolute goal machine. Ba is an absolute goal machine, and it is a surprise he never really got a chance at a big club, Chelsea signed him to be back up striker from day one even though his goal scoring record has been excellent throughout his career. Claims of dodgy knees have followed him through his career and were likely the reason why Stoke City pulled out of a transfer to sign him before he moved to West Ham, but he hasn’t been out injured much and when he has they haven’t really been related to his knees if my memory is working correctly. Now back at Shenhua, they will be hopeful that he keeps up that amazing goal record helping to propel them up the Chinese Super League, say it quietly but it is very possible that he could strike up a deadly partnership with Obafemi Martins. If Martins and Ba hit it off Shenhua could have a strike force that the rest of the Chinese Super League will soon learn to fear.